BCAA Scivation by Xtend Review - Boost Your Workouts! Xtend by Scivation is a sugar free BCAA (branched chain amino acid) supplement that's designed to enhance your workout performance. It contains a blend of 2:1:1 ratio of Leucine, Isoleucine, and Valine. In essence, you're consuming a pure BCAA product. To note though, there are 2 important additions to the formula which are electrolytes and citrulline malate. I have 2 workout drinks that I like to use. One is Optimum's Amino Energy (gotta love the orange flavor), and the other is Extend - definitely go with the watermelon flavor. I actually keep both of these stocked up in my cupboards, and just alternate between them depending on what flavor I feel like. While this product has a simple formula, the consumption of BCAA is proven to greatly enhance recovery and improve exercise and workout performance. I'll cite a few studies in just a bit. You may have noticed the claim made by Scivation about using Xtend to build muscle and burn fat. The consumption of amino acids during exercise has been found to improve lipid oxidation. [see footnote 1] Other similar types of studies done on BCAA has found it to greatly enhance exercise capacity by increasing the lactate threshold in athletes. While I can't say that consuming this BCAA drink helped me burn fat (I don't think it did), but it certainly increased my endurance and stamina during my workouts. The other interesting, and very beneficial addition to Xtend is citrulline malate. What is it? It is a non-essential amino acid that boosts ATP production, enhances recovery, increases energy, and reduces fatigue. We have discussed citrulline malate here in detail, so we won't go in more details here. If you want to know which flavors taste great, I'd highly recommend lemon lime, pink lemonade, and watermelon. Certainly the watermelon is my favorite. The next time you head to the gym, instead of bringing a jug of pure water or Gatorade with you, put a scoop of Xtend in it, and sip it through out your workout. You'll not only love the flavor and the refreshing taste, you'll probably notice a greatly improved workout performance with a lot less feeling of fatigue, and quicker recovery times. This product comes in 30 serving and 90 serving containers - I do suggest the 90 serving, not only because it's more cost effective, but because I think you'll probably find that 30 servings of this great tasting stuff is just. not. enough. As far as the flavors go, like I said, watermelon is my favorite, but the lemon lime and pink lemonade are amazing as well. 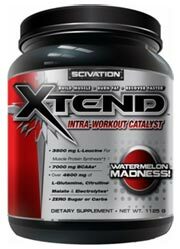 There's a good reason why Scivation Xtend is such a popular product: it tastes great, and it works! 1. J Sports Med Phys Fitness. 2011 Mar;51(1):82-8. 2. J Nutr Sci Vitaminol (Tokyo). 2009 Feb;55(1):52-8. Branched-chain amino acid supplementation increases the lactate threshold during an incremental exercise test in trained individuals.